Savannah, Georgia is a classic city of the Deep South, which grew on the backs of slave labor and the fortunes of cotton-farming. The downtown area is laid out in an unusual way — homes and neighborhoods were centered on a series of 24 squares which are now landscaped and preserved as city parks. Twenty-two of the original squares designed by General James Oglethorpe, the founder of Georgia, still remain and they provide a charming walking tour of the downtown area. From the Parking Lot on West Congress St, proceed eastward on West Congress Street to Johnson Square. Note the Christ Church (at Bull & East St. & Julian Sts). The original structure on this lot was the first church in the Georgia Colony (1733). This later building was constructed in 1838. Continue east on Congress St, past Reynolds Square to Warren Square. Take a right onto Habersham and proceed to Columbia Square. 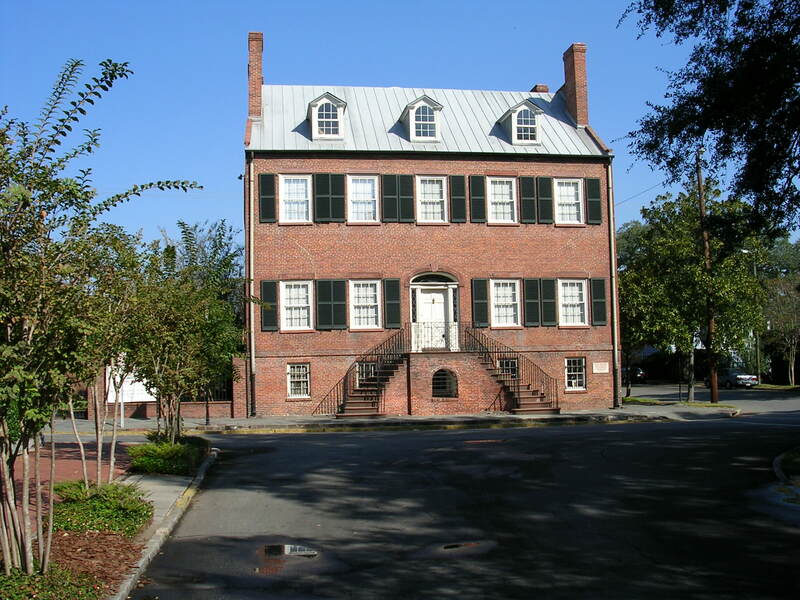 Turn right again and notice, at 324 E State St, Davenport House (1820) whose preservation in 1955 spearheaded the city to cherish and restore its history, resulting in the situation today where much of Savannah’s past is on display for the world to see and admire. Continue westward on State St to Oglethorpe Square (named after the colony’s founder), then left onto Abercorn St. At #124 is Telfair’s Owens-Thomas House (1816) where the Marquis de Lafayette was a guest in 1825. Continue westward on State St to Wright Square, then take a left onto Bull St. The Birthplace of Juliette Gordon Low is located at 10 East Oglethorpe Ave. She was the founder of the Girl Scouts of America. Continue southward on Bull St past Chippewa Square (made famous at the beginning of the movie, Forrest Gump, although the bench was only a prop and has been removed) and down to Madison Square. As you circle Madison Square, note the Green-Meldrim House at 14 W. Macon, which served as General Tecumseh Sherman’s headquarters during the siege of Savannah in 1864. Then proceed eastward onto East Macon St to Lafayette Square. The Andrew Low House is at 329 Abercorn St and was the adult home of the same Juliette Gordon Low who established the first Girl Scout troop in 1912. 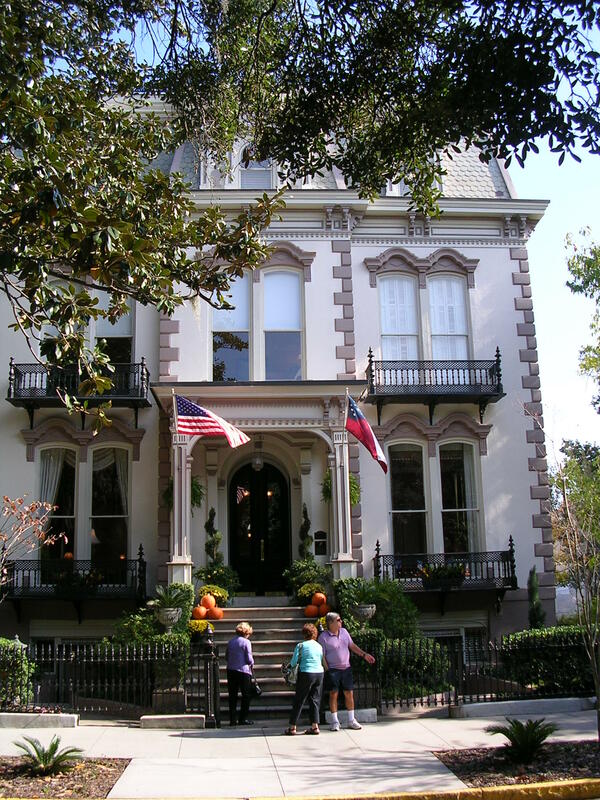 The Hamilton-Turner House (330 Abercorn) was featured in the novel, Midnight in the Garden of Good and Evil and is reputed to be haunted. Note also the Cathedral of St John the Baptist (222 E. Harris St), one of the south’s largest cathedrals. Retrace steps westward on East Macon St then left onto Bull Street, then right on West Jones Street. At 107 West Jones, get in line and stop for lunch at Mrs. Wilkes Dining Room, an incredible experience with authentic Southern food. When finished, retrace steps to Bull Street, take a right and proceed south to Forsyth Park. Stroll around the lovely square-turned-park, checking out the beautiful fountain, erected in 1851. Afterwards, hop on a CAT Shuttle headed back toward the riverfront. Get off at City Hall, at the junction of Bull and Bay Sts. Next, wander the riverfront area, strolling along Factor’s Walk and River Street, stopping occasionally to browse in the many shops. Notice, in particular, the Waving Girl Statue, on River Street (a reference to Florence Martus, who, in the early 1900’s, promised her sailor sweetheart that she would wave to every ship until his return). Riverboat cruises are available at the River Street Riverboat Company, near theVisitor Center. 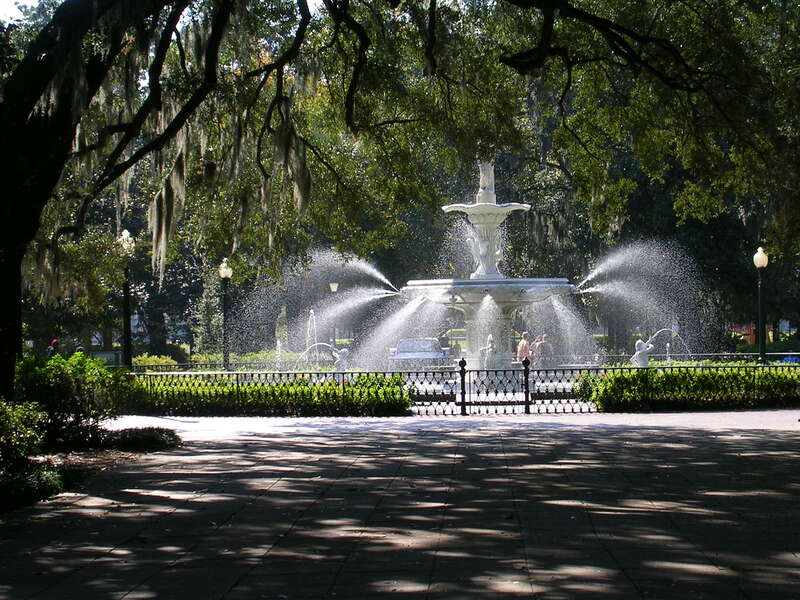 I’m very interested with image of Forsyth Park. Can I use that image for book cover? Is that a free image? This is my own photo of Forsyth Park. Will I receive credit for the photo? If so, I will be happy to let you use it. 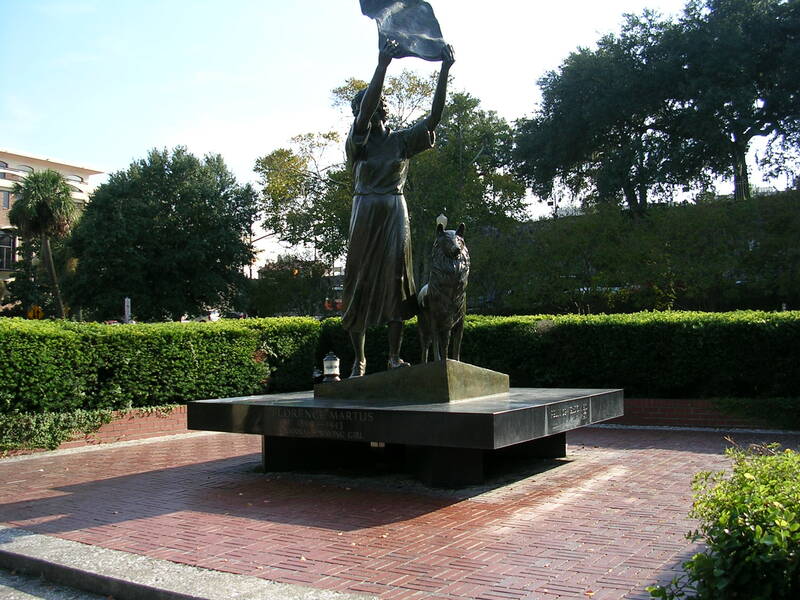 Gary – This is in regard to the request you received from “Adi”for use of your photo of the fountain in Forsyth Park. He is working on a book cover for a novel I have written, THE INDICTMENTS (a legal thriller). It is a sequel to my earlier novel, SAVANNAH LAW. (www.savannahcollegeoflaw.com). Both novels are written with Savannah as the locale. Adi found your photo of the fountain and thought it was excellent for his use. I agree. Adi is in design contest with others for the book cover design for THE INDICTMENTS. If his design should be selected, using your photo, I would be pleased to give you credit for the design. And if you are interested, I would be pleased to send you a copy of SAVANNAH LAW now, as well as THE INDICTMENTS, when it is published. Mr Eleazer — Thank you very much. I would love a copy of your books. We abolutely loved Savannah both times we visited and to re-visit, albeit through literature, would be a pleasure. I’ve enjoyed looking and reading through your blog. It is certainly one the best travel blogs I have ever seen. Congratulations on so many great photos— you have a professional’s eye! And just send your mailing address to my e-mail address, and a copy of SAVANNAH LAW will be on the way.